Exchange management is a headache. This statement is supported by countless articles, blog posts and forum topics in the Internet. Web searches yield a myriad of various tips and best practices on how to streamline the process and make it less expensive. With all the vast amounts of information available, the problem is still there and desperately needs a strong and effective solution. Why is there so much talk and fuss about Exchange management? The answer is straightforward: because it is expensive as it involves a lot of manual work by skilled technicians. Consider the following. When a new employee comes in, someone needs to create and configure a new mailbox for the employee. This requires knowledge of how to pick a mailbox database, which mailbox features to enable for this particular user, which mailbox policies to assign, etc. When an employee is relocated to a different city, promoted, or transferred to another department, somebody has to move their mailbox to another database, adjust mailbox rights, change mail flow settings, etc. When an employee goes on a sick leave, somebody must set the Auto-Reply message for the user, configure email forwarding, put the mailbox on retention hold, etc. When an employee leaves or retires, their mailbox must be properly deprovisioned, which is a complex task that requires multiple steps to complete. What does all this mean? It means that somebody has to learn and consistently follow a rigorous set of guidelines and policies for Exchange management. Not only is it ineffective and a huge waste of human resources, it also leaves too much room for human error - the root cause of downtime and out-of-compliance issues. EXCHANGE MANAGEMENT IS A PAIN: stop doing it! Wouldn't it be great to delegate those routine Exchange management tasks and forget about it for good? If you are reading this, most likely you are dreaming about such an opportunity! The good news is you are on the right place, as Adaxes is ready to do all the hard job for you accurately, timely and in accordance with strict policies and procedures. Read on how you can leverage Adaxes to completely automate Exchange management and administration. With Adaxes, you can completely automate the process of provisioning and management of mailboxes, distribution lists and mail-enabled recipients in Exchange 2003, 2007, 2010, 2013 and 2016. It all starts when something happens in the real world. When a new employee is hired, a user account is created in Active Directory. 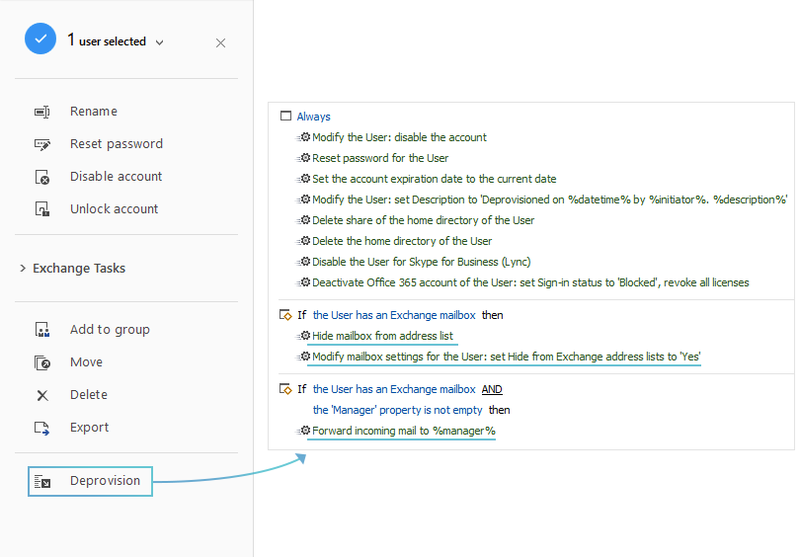 This triggers Adaxes to automatically create an Exchange mailbox for the newcomer and modify mailbox parameters based on the data entered during account creation. By establishing rules for mailbox provisioning, you can define when to create a mailbox, how to generate the alias, and tell Adaxes how to pick a database. To uniformly distribute mailboxes among databases you can configure Adaxes to choose a database with the least number of mailboxes, use the round-robin method, or pick a database based on, for example, the office location of the user. You'll definitely want Adaxes to also configure newly created mailboxes. No problem. 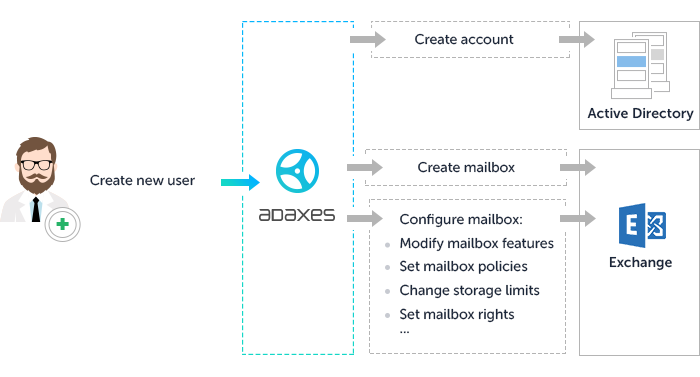 Adaxes can automatically enable or disable mailbox features, like Archiving and Unified Messaging, set mailbox policies, modify mailbox limits and quotas, adjust delivery options, set mailbox rights, and much more! 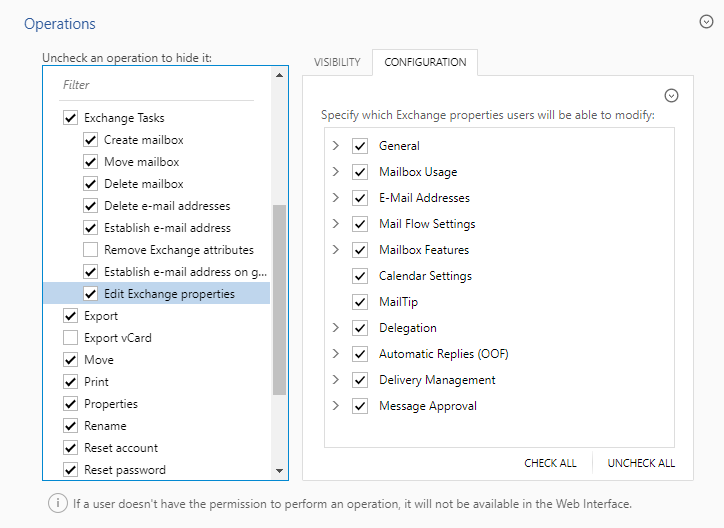 For more details, see Automate Exchange Mailbox Configuration. When a user account is updated, following predefined rules Adaxes can automatically make appropriate changes in Exchange. Without any user interaction. For example, when an employee moves to another office, this usually requires changes to multiple applications, including Active Directory and Exchange. With Adaxes, the whole process flows from a centralized web console, with only one change triggering a chain of other changes. In other words, it is enough to update the Office property in Active Directory, Adaxes will do the rest of the job automatically. For example, it can move the mailbox to another database, update mailbox properties, add the user to a distribution list associated with the new office, etc. When an employee leaves, all resources associated with them, must be deprovisioned. From a process standpoint, deprovisioning is a way more complicated than simple deletion, and there are plenty of reasons for that. In most cases, you don't want to delete user accounts, mailboxes, and so on immediately upon the departure of an employee. Instead, you want to disable the account, hide the mailbox from Exchange address lists, forward incoming mail to the manager, move the mailbox to a database dedicated for terminated mailboxes, etc. In this regard, Adaxes also can offer something that makes your life easier, and this something is Custom Commands. Using Custom Commands, you can turn any complex, multi-step operation into a one-click action. Adaxes, out of the box, already contains a Custom Command called Deprovision that is configured to perform typical deprovisioning actions, and can be customized to meet your own needs. All one need to do to deprovision an employee is a mouse click! While automation is perfect for repetitive tasks, sometimes human interaction is still needed, for example, to handle support cases. This requires a modern, efficient and reliable management tool. An easy-to-use web-based interface provided by Adaxes includes an array of convenient features that allow administrators, managers, help desk personnel, or anyone else to manage Exchange mailboxes, distribution lists, and mail-enabled contacts via simple and intuitive web-based console. It is a must requirement for any good management tool to be flexible enough to allow users to see only what they need to see and to do only what they need to do. A good user interface must be clear and simple. It is particularly important if you delegate Exchange management tasks to non-technical or less qualified people. If the user interface is overloaded with features and options that users don't really need, be sure, one day somebody will click on the wrong button and break something. Adaxes Web Interface is built with customization in mind. It gives you the ability to customize any view and input form, define which operations are available for users, customize every operation to address your unique needs and goals. The ability to granularly delegate permissions for Exchange management tasks is essential. You will be happy to know how easy it is to control the scope of delegatee's administrative power with the Role-Based Access Control model implemented in Adaxes. For each Security Role, you can explicitly define the minimum permissions required for role users to accomplish their duties, without providing unnecessary access. For example, you can allow your Help Desk to only update Auto-Reply messages, and enable, disable and configure Unified Messaging services and Archiving. At the beginning, this article claimed that Exchange management was difficult. Now, when you are reading these lines, you may probably feel a bit confused. Sorry. In fact, Exchange management is simple when you use the right tools. And Adaxes is the key to success.